My pick of stories: "The Ramayana as an American Reality Television Show" by Kuzhali Manickavel for it's accurate portrayal of the online culture. "Sita's Descent" by Indrapramit Das for the breathtaking images it conjures. "Sarama" by Deepak Unnikrishnan for how it made my shudder at certain points. "Falling Into the Earth" by Shweta Narayan for it's intriguing modern interpretation. And "Princess in The Forest" by Mary Anne Mohanraj for one of the most hard hitting last lines.There were many other stories which I enjoyed reading but overall they didn't make an impact. Some stories felt forced and boring. But it is a commendable effort and hope more such efforts come up.I was a little disappointed by the focus of most of the stories on handful of Ramayana characters and on few episodes of the epic. "Machanu Visits the Underworld" takes up a little known episode and little discussed characters and works with them but it didn't work for me. One story mentions Ahalya. But there is no Shabari. No Vibhishan, Sugreev, Bali, Nishadraj, Bharat, Kaushalya, Manthara. No Meghnad, Kumbhakaran. And despite all the reinterpretations, there is no Wicked Sita! :)Ye dil maange more! A collection of short stories (speculative fiction) inspired by the Ramayana: all original, most of them odd, some of them spectacular. There are elements of sci-fi, fantasy, robots, magic, surrealism in the stories. A unique experiment, left me feeling it could have done better. To the credit of the authors and the editors is the courageous attempt at trying something radically different. Doff the hat for that.The story that I really liked was Test of Fire by Pervin Saket. Consider this paragraph: '... What doomed Manus was the need to seek approval from even the lowest rung. The desire to be respected by those whom he could never have respected back. The act of giving up every scruple he had, every principle he upheld, only to be adored by one more person. The Ideal Man didn't value his own opinions, only those that others had of him. 'Hard hitting. Incisive. Just for that one paragraph, it is worth reading the entire book.I'd give the book a 2.5 out of 5. The story by Pervin Saket, I'd give 5 on 5. 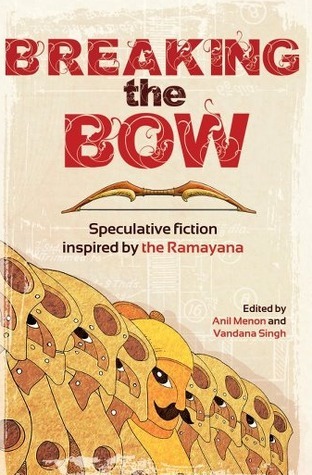 I enjoyed this collection of SF stories inspired by the Ramayan. I'm familiar with the rough outline of the story from my childhood, but I don't have the deep immersion that I would have had if I'd grown up in India (in the way that I've absorbed the Christian stories just by living my life in Britain, without ever being Christian). This meant that the book was read with Wikipedia always at the ready, to look up names, places and events that Indians would just know. Still, like I say, I'm familiar with the basic story and it was fascinating to see the various different interpretations put on it in this collection.Most of the stories were fairly sympathetic to the villain of the traditional story, Raavan and they also tended to pick up on the tail end of the story - the bit that many people tend to forget, where after Raam has won Sita back, he doubts her chastity and rejects her. The book contains stories from across the SF spectrum, from hard SF, through traditional fantasy to the fence-sitting of magical realism. My favourite story was one of the more sci-fi interpretations, Sita's Descent by Indrapramit Das, about an giant intelligent nanite cloud named Sita, who takes the stories that she's based on a little too literally. Other standouts for me include The Ramayana as an American Reality Television Show (with social media fallout after an episode of the show); the somewhat disturbing, dark piece Weak Heart; and the modern day story Kalyug Amended, with its absolute killer final line.This is a great collection to dip in and out of and makes me think in different ways about the stories of my childhood. I'd be happy to read many of these stories again (I say that about a lot of books, but there's always the next shiny thing to read, so I never get time. Still, this book will stay on my shelves in the hope that one day I do have the time). This was a very interesting read for someone with a background on the general events of the Ramayana. I do feel if I had a more thorough knowledge of the Ramayana I may have gotten more out of some of the stories in this anthology, felt lost with a few of them, but I really enjoyed them nonetheless. Compelling stories of time travel, sci-fi, futuristic tech, and more were the most interesting, followed by modern-day heartfelt interpretations of the classic relationships between Rama, Sita, Lakshmana, Ravana, and others. I remember thinking I wanted to read this when I first heard talk of the project. Then at Readercon, I attended a panel representations of gods in SFF, and Anil talked about the history of reinterpretation of the Ramayana, and it renewed my interest. He also mentioned retellings from past centuries, including (if I'm remembering right The Sound of a [or the?] Kiss, a retelling from Sita's point of view from I think he said the 1600s? (Or sixteenth century? Anyway: long ago)--I'd like to take a look at that, too. Many of stories bored me - scifi-ing up the Ramayana (or Hindu mythology) is difficult and can leave a bad taste in the mouth if not done well. I skipped many of these stories altogether Many others were readable, but repetitive - mostly Ravana/Sita's perspective. Where is Hanuman/Vibhishan/Lakshman/Kaikeyi's story? I feel a lot more could have been done. Don't read this book if you want to stick to the classical, good-vs-bad Ramayana story. Much of this may seem disrespectful/blasphemous if you cannot digest the questioning of religion. With many creative short stories inspired (in varying degrees) by the Ramayana, this is well worth reading. Not all the stories are equally readable, even though they are all innovative, and justify fully the 'speculative' tag. Some of them did not appeal to me because the effort behind he writing was all too evident - these seemed to have been written more as 'creative writing', less stories with heart. Still, the stories that do work make it fully worth your while. My favourite story in this collection is the social media, reality TV version. But it was interesting to read the diverse variations across genres.